I realize that commenting on the changing seasons is beyond cliché at this point, but I promise you that I have no intention of mentioning anything having to do with pumpkin, pumpkin spice or (heavens no) using an acronym like PSL. If you don’t know what that means, bless you. You have eluded the omnipresence of social media – at least for now. That being said, as the weather has begun to cool off I’m finding myself reverting back to my cold-weather cravings. Beef stew, kale (it’s a cold-weather food for me, don’t ask) and squash are all at the top of my list. 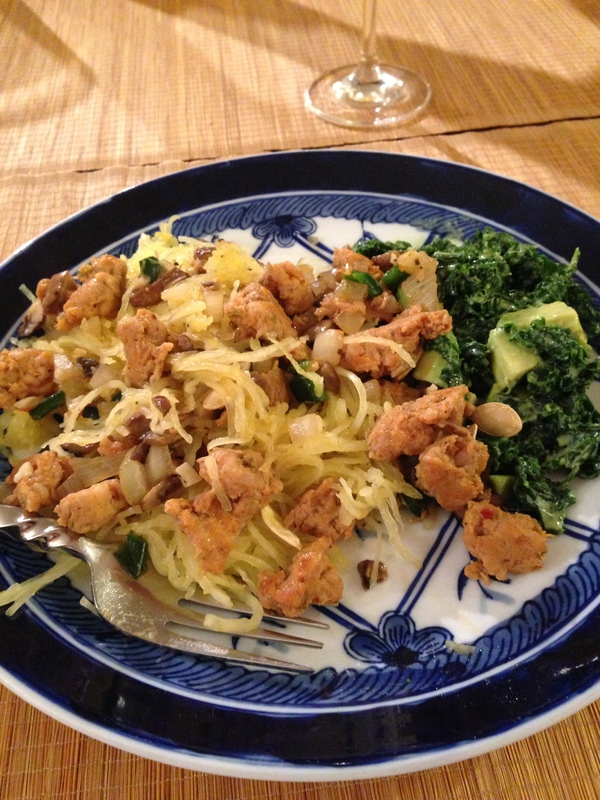 Speaking of squash, spaghetti squash has always been a very comforting dish to me. Most likely because it reminds me of pasta. And pasta reminds me of mac ‘n cheese. Always. Ergo, spaghetti squash = pasta = mac ‘n cheese = CHEESE = bring me a blanket and turn on my stories. So seeing as these cravings are in full force and spaghetti squash has descended upon my local grocery store, I whipped up a great little dinner to share with you all. 2. Carefully use a large knife to slice squash in half lengthwise. Scoop out the seeds and stringy part out of the center, reserving the seeds (optional). Spray the squash with cooking spray and season with garlic powder, salt, pepper and place on a baking sheet, cut side up, and bake for about 40 minutes, flipping squash over halfway through. Once the squash is just tender enough to pull away in strings from the outer peel, it’s done. 4. Using a fork, pull squash away from outer peel, starting at the edges, until it is all pulled into strings. Reserve the “shells” for serving, if desired. 5. While squash is baking, heat a skillet over medium-high heat and add sausage. Break sausage up with a wooden spoon until beginning to brown, about 5 minutes. 6. Add peppers, onions and mushrooms to skillet and sauté until they are just tender. Add garlic and cook an additional 2 minutes. 7. Add chicken broth and season with additional salt and pepper, to taste. Allow to cook until broth thickens slightly, about 3 additional minutes. 8. To serve, spoon sausage mixture over squash (either in the shell or serve like pasta on a plate) and sprinkle roasted seeds over everything. This is an incredibly filling meal. It’s stick-to-your ribs satisfying, but it won’t make you feel all bloaty and droopy like a big bowl of cheesy pasta might. Not that I’ve ever overdone it on mac ‘n cheese. Obviously. The great thing is that this recipe can easily be adapted to whatever kind of sausage you prefer (hot sausage or even chorizo would be great in this) and any kind of vegetables you have on hand. It would even be great with leftover chili! Also, I should note that while I listed the servings as 2-3 people, you could easily feed 4 with this amount of food. I only ate about 1/2 of a 1/2 squash and was full for the rest of the night (and I can eat, you guys). So feel free to gorge yourself or split up your portion, because leftovers are awesome. Happy pumpkin season fall, everyone! 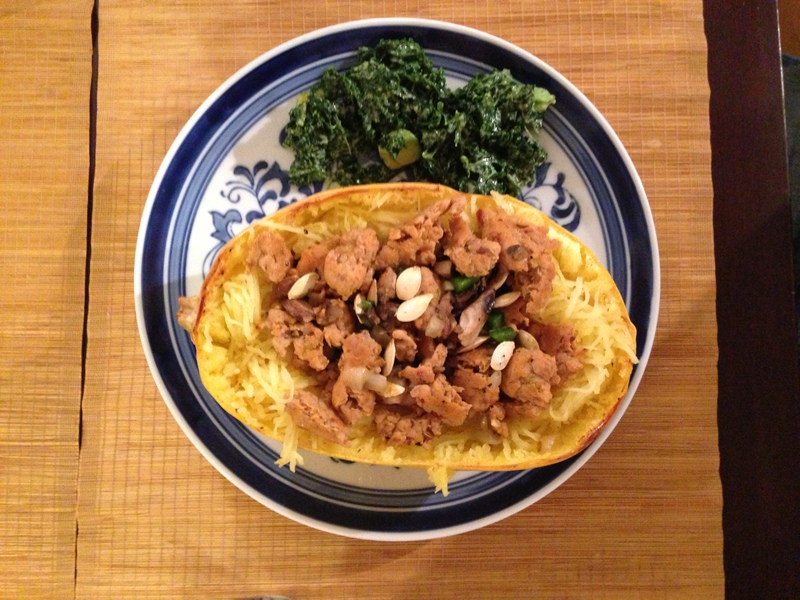 I just discovered stuffed squash last year and it is AMAZING! I agree, so filling! 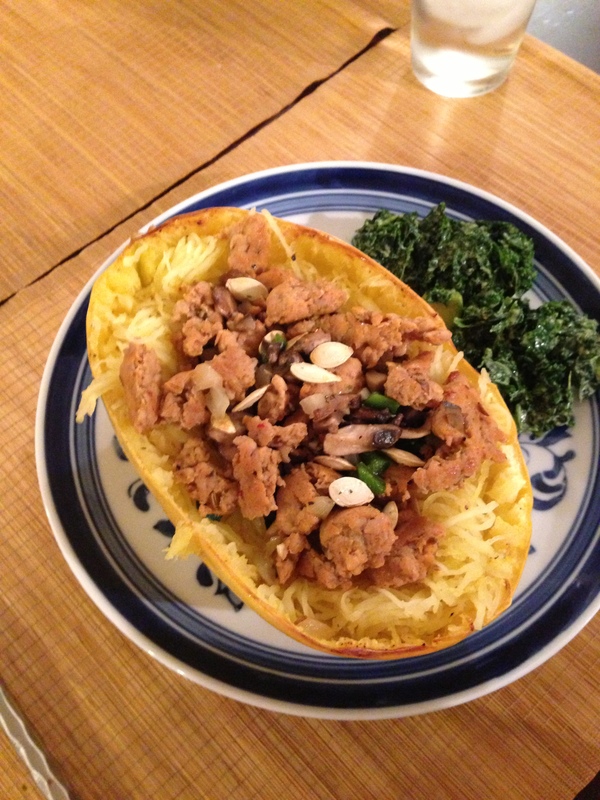 I looooove spaghetti squash! Last year I pushed it on everyone. Unfortunately it’s still in the high 80’s here, which is still to hot for me to justify turning on my oven, but I can’t wait till the weather gets cooler! I feel like telling you to be careful what you wish for, but I kinda agree- I’m craving my oven! Wow, this is the perfect fall recipe! And I’ve been looking for a new way to sneak in my veggies…thanks for sharing! Thanks for reading, Tess – hope you give it a try!